Event planning is filled with questions: Who should be invited? What time should the event start? What food should we serve? Where should we host the party? All of these questions only bring more uncertainties that can further complicate things, making the event planning process difficult and complex. One of the best parts of event planning is coming up with ideas for entertainment. We all want our events to stand out and be larger than life, and choosing the right entertainment is one way to do that. Supersized games give event planners and hosts the opportunity to make their party a memorable one, filled with some huge, unexpected surprises! In this article, we’ll talk about supersized classic games that we offer here at Creative Event Services. Let your imagination run wild with these larger-than-life classics! We’ve all played the classic games like chess and checkers, and normally those aren’t names we’d associate with a blowout, fantastic event; however, there’s a way to bring those historic, classic charms to your event – make them supersized! Giant board games and other fun activities don’t have to be small and exclusive to only two players; you can involve the whole family, the whole party, or the whole crowd. It’s not every day that you need two people to move a chess piece! Read on to learn more about the different options you have for life-sized games at your next event. At Creative Event Services, we’ve got some of the more common games like chess and checkers, but we also have some unexpected classics like tick-tac-toe and connect four that your guests are bound to play all night. 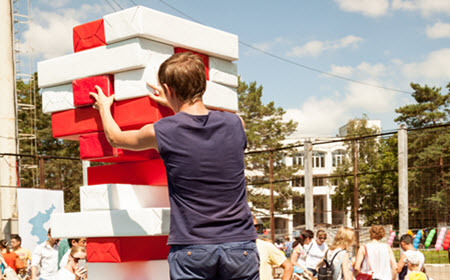 Giant Jenga or Poly-Pong also stir up the excitement at parties, putting guests into competition mode. What’s So Great About Supersized Games? Whether you’re planning and hosting a corporate get together, a birthday party, a special occasion like a bar or bat mitzvah, a new year’s bash, or an engagement party, supersized games are unique and fun no matter what! 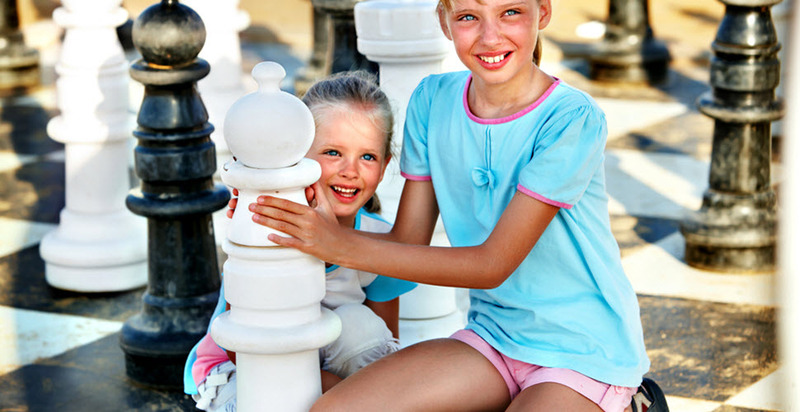 Family game night is classic and fun, and so are supersized games – but with a huge twist! They’ll wow guests from younger to older, small to tall. Because supersized games are a great option for all ages, they present the perfect bonding opportunity for multiple generations to come together and teach one another. For instance, grandma might not be familiar with Jenga, and grandchildren might not be familiar with chess, and they can teach each other with the extra fun of life-sized game pieces! If you’re struggling coming up with creative solutions to your event-planning needs, allow Creative Event Services the opportunity to make your next party a huge success. Event hosts from all over the areas of Boston, Hartford, and New York have given us the chance to pull off lavish, memorable events for them, and we aim to never disappoint. Supersized games are a great way to let your event stand out and create some fun memories for all who attend. If you’d like to learn more about the supersized game options available, please feel free to look over our website or contact us directly.